This morning, I saw my brother’s shared link in FB about McDonald’s Session Road in Baguio City closing after 23 years. It is actually a sad thing, really. (You can read more about it here). McDonald’s Session Road is the first ever McDonald’s franchise in Baguio. It is located in Lower Session Rd., corner Lower Mabini St. across PNB Building. You cannot actually miss it when you’re in Session Road. 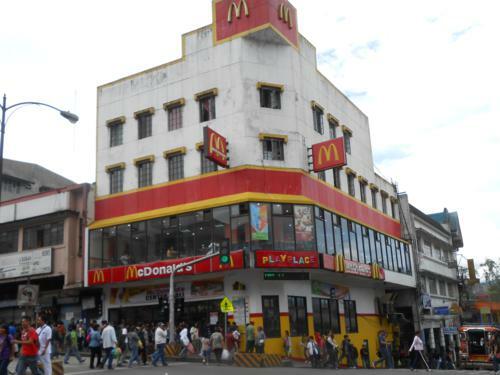 The first ever McDonald’s in Baguio was franchised by the Del Rosarios (who also own Sunshine Supermarket, Hotel Veniz and other businesses within the city). That’s all I know actually about it. I learned about the history of McDonald’s in Baguio when I read the article. All I knew was that the McDonald’s in Session Road was there for so long it seems surreal that it is now closing. Since this place is very accessible and can be easily found, this has been our meet up place when I was in grade school until high school (when cellphones are not yet popular and setting appointments and meet ups need planning days before). My friends and I would normally decide to meet up in front of McDonald’s Session Road when we go out on Saturdays. Our meeting time would be set at about 8:30 AM until 9:00 AM to give a leeway to those coming from relatively far places. It was not just us who do this, actually. This place was a common meet up area. When I was in high school and my friends and I decide to eat out, we normally end up here. We would have our value meals (and I would always order the cheapest one 😛 ) and we would combine all of our fries in one tray just for the heck of it. We would also request for lots and lots of ketchup because we had a thing for fries and too much ketchup during those days. Then after eating, we would tear the plastic cups and either slice through or put holes on the Styrofoam containers (yes, we used styro containers back then) for the fear that it will be washed and reused. We would stack up the cups and putting all left overs in one of the Styrofoam containers, put all the straws and utensils inside the cup then carefully arrange everything on the tray provided when we ordered. There are times that we would even leave a note on a used tissue spread out on front of the so-called tower we created. The messages usually contain some sort of greeting or saying have a nice day to the crew who would eventually clean our table when we leave. Oh, the memories! Just writing those paragraphs made me reminisce all those fun times spent there. I guess, when you ask Baguio people about McDonald’s Session, they would be able to tell you a story or two. I can’t believe that it has been 23 years. And I never thought that there would even come a time that this store would close its doors. I wonder what would replace this store. But I sure will miss that bright red and yellow paint that defines the colors of McDonald’s. According to Mike Del Rosario (the franchisee of McDo Session), the lease contract is expiring. Looks like they’re not going to renew, though..